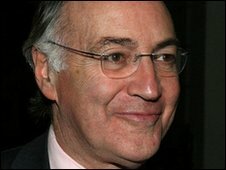 BBC News - Was MP Michael Howard buzzed by aliens? Reports of a UFO hovering over former Conservative Home Secretary Michael Howard's home are among thousands of odd sketches, strange sightings and alleged close encounters detailed in newly released UK documents. More than 6,000 pages of reports describe people's experiences with unidentified flying objects, mainly between 1994 and 2000. Among them are details of how the Ministry of Defence (MoD) received reports of a large, triangular unidentified flying object hovering in the sky above Mr Howard's home near Folkestone, Kent, on 8 March 1997. Eyewitnesses in Burmarsh and New Romney reported seeing the "humming" object, said to have been the size of two passenger planes. Newspaper cuttings from the time reveal that Chris Rolfe, co-ordinator of group UFO Monitoring East Kent (UFOMEK), warned how the object could have been looking for Mr Howard, who later went on to lead the Tory party. Mr Rolfe said: "It would seem the UFO was disinterested in Sophie, the girl who reported it and watched it for quite a long time. "This certainly makes it seem like it had a purpose and has left me wondering if its purpose had something to do with Mr Howard." UFOMEK compiled its own report on the sighting and sent it to the prime minister, the Home Office and the MoD. One eyewitness account in the UFOMEK report said: "It was just a huge triangle thing, which was a lot bigger than an aeroplane or anything like that. "It had lights all around the outside, and this disc attached to the back, and a big light on the front. I pulled up to a stop and as I did it shot off." The RAF investigation into the sighting found nothing unusual. This case and more UFO encounters are revealed in the fifth instalment of document releases as part of a three-year project between the MoD and The National Archives. In another account, a man in Ebbw Vale, Blaenau Gwent, claimed to have seen a UFO as he was driving his car on a clear and dry night, at 2240 on 27 January 1997. Many of the released files included sketches. A craft containing three beings was drawn by a passenger on a flight from Heathrow to Hong Kong in 1993. A drawing and description of a "flying saucer" sighting over Watford in Hertfordshire was also among the 6,000 pages of newly-released documents. A sighting above Trenale Lane, near Tintagel, Cornwall, was also documented. The artist identified a dome at the front of the craft as the cockpit. Another eyewitness submitted a drawing of a triangle-shaped craft seen close to a pylon above Knutsford in Cheshire. Two "missile-shaped" UFOs were also captured in a sketch by a witness in Smethwick, West Midlands, in 1954. 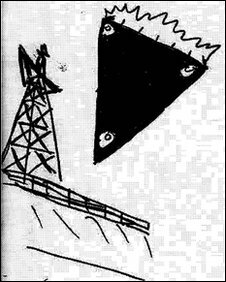 A triangle-shaped craft was also drawn by a witness who described seeing it above Oldbury, West Midlands, on 9 August 1995. Another notes the diameter of the unidentified craft they saw flying above their car in Malmesbury in Wiltshire. In his report to police the following day, the man, from Newport, Gwent, said his car had been surrounded for five minutes by a "tube of light" which had swept towards him from the north east, during which time both his radio and mobile phone stopped working. The man reported that he was ill following his brush with the unknown. The report said: "He felt and was indeed sick later on. He is still feeling ill today (28/1/97) and has developed a skin condition. Advised to see doctor." This sort of episode would be classed by UFO experts as a "close encounter of the second kind" - a UFO sighting followed by an associated physical effect. In another report, recorded on 11 June 1997 without a location, a man claimed he had been visited by a flying man - what is referred to as a "close encounter of the third kind". The man said he had been sat in his living room, where he also slept, when a man walked in and lay on his quilt. The report said: "The window then went all white and the [visiting] man whooshed through the window. "[The witness] then called the police who wouldn't come to his house because they thought he was 'a nutter', so he phoned Scotland Yard and the fire brigade. "He wanted the police to see the quilt where the man had been because the indentation showed that the person just lifted off the quilt without getting up from it in a normal way. "The man stressed that he was not a crank and was not on drugs." The pilots of a Boeing 737 aircraft had a "near miss" with a UFO on 6 January 1995 while they were approaching Manchester Airport, the files reveal. British Airways Captain Roger Wills and co-pilot First Officer Mark Stuart both saw a lit object fly down the right-hand side of the aircraft at high speed from the opposite direction. Manchester Air Traffic Control did not record any known traffic in the vicinity on radar and the incident was investigated by the Civil Aviation Authority (CAA). But neither it or the MoD could find evidence of extra-terrestrial activity. Also included in the latest releases is a letter from senior MoD official Ralph Noyes, in which he describes seeing a film of UFOs captured by RAF fighter pilots in 1956. Mr Noyes claims the footage was shown at a secret underground screening arranged for air defence staff at the MoD in 1970. And a memo reveals how former Prime Minister Winston Churchill expressed curiosity in "flying saucers" and requested a briefing from his ministers. He was told in reply that following an intelligence study conducted in 1951, the "flying saucers" could be explained by "one or other" of four causes. These were known astronomical or meteorological phenomena, mistaken identification of conventional aircraft, optical illusions and psychological delusions, or deliberate hoaxes. Experts say the records highlight how shapes of reported UFOs have changed over the last few decades, possibly explained by representations of UFOs in popular culture. Many reports in this latest file describe aircraft as big, black and triangular in shape with lights along the edges, whereas the predominant form in the 1940s and 1950s was saucer or disc-shaped. Dr David Clarke, author of The UFO Files, said: "In the 1950s, the next big leap in technology was thought to be a round craft that took off vertically and it's intriguing to note that this is the same period when people began to report seeing 'flying saucers' in the sky. "In the period the latest file release covers, triangular-shaped US stealth bombers and Aurora spy planes featured heavily on TV, such as The X Files..., and films such as Independence Day released in 1996, and the shape of reported UFOs corresponds. "It's impossible to prove a direct link between what people are reading and watching and what they report as UFOs but one interpretation could be that the latest advances in technology may be influencing what people see in the sky." The files are available to download for free for a month from the National Archives website. Have you ever seen a UFO? You can send us your comments using the form below. You can also send us your pictures and videos to yourpics@bbc.co.uk or text them to 61124. If you have a large file you can upload here.